Zoals veel van jullie ongetwijfeld al gehoord hebben, heeft Beursschouwburg in de herfst een programma gelanceerd genaamd "The Future is Feminist". Binnen dit programma doen we drie participatieve workshops onder de titel Chanting & Recording. Door gastsprekers en artiesten uit te nodigen, zullen we kijken naar alternatieve geschiedenisbronnen, chanting en gaan we op zoek naar manieren om courante visies op de geloofwaardigheid van bronnen te decoloniseren. Wikipedia wordt in deze evenementen in verschillende mate gebruikt, afhankelijk van de gastspreker/artiest en het specifieke onderwerp. We nodigen jullie uit voor een event met input en output, waarin we aan de slag gaan met mondelinge geschiedenis en het belang ervan als narratieve en collectieve praktijk. Feministische chants en slogans leiden ons bij het bewerken van Wikipedia-pagina's met als doel vermiste vertellingen aan de polyfone collaboratieve encyclopedie toe te voegen. We organiseren dit jaar een laatste werksessie op het festival Voix de Femmes in Luik. We zullen ons focussen op vrouwelijke pioniers van elektronica, meer bepaald in muziek, kunst en activisme. Onderzoek samen met ons hoe we deze heldinnen het beste kunt opnemen, met een focus op mondelinge geschiedenis, muziek en alternatieve geschiedenisbronnen. Ladyfest are non-profit, community-based music and art festivals which aim to create a platform for expression, creation, discussion, collaboration, and celebration of feminists, women, trans and gender-non-conforming people. The first Ladyfest was conducted in Olympia, Washington, USA in 2000 in order to react to the invisibility of women on the artistic and musical scene. Since then, it has grown into an international non-profit event concept which has been organised in more than 50 cities all over the world and keeps spreading. At Ladyfest Maastricht on Saturday the 27th of May, we will give a two hour workshop in which we will introduce how to contribute and amend meaningful content to Wikipedia, with a feminist perspective and a specific focus on the biases in the way we write about women and how to make quick and effective changes! On the first of January each year, new works enter the public domain: those whose copyright expired, which in Belgium happens 70 years after the death of the author. Works in the public domain can be freely used, modified and published, on Wikipedia for instance. Join us in Brussels for a Public Domain Day organised by Constant, CRIDS, Cinema Nova and the Royal Library of Belgium on the 27th of May 2017. For this occasion, in collaboration with Femke Snelting, we are preparing a performative collection of texts. A collection that plays with the concepts of public domain, copyright, and the idea of the individual author that these two concepts both celebrate. What kind of new rituals and identities can we imagine for future creations? A workshop in the context of Art+Feminism, an internation campaign initiated in New York by several artists, raising awareness on the mis-representations in the body of knowledge available about feminism and the arts on Wikipedia. This workshop will introduce how to contribute and amend meaningful content to Wikipedia, with a feminist perspective, and a specific focus and selection of books and documents on women artists’ books and multiples. An event on performing arts, in which we will look into the topic of collective memory, both in our everyday life and online. Who is remembered and what shapes our perception of society before and now? We will be examining the field of performing arts and its representatives for answers, trying to map out this field by inspecting both the hive-mind of the participants and the online platform of Wikipedia. We will use this evening to have a look at the links between how we remember our society and how we are recording it today. Caroline Godart will present a reflection on the Internet, Western culture, and the forgetting of women. 18:00 – Caroline Godart - A reflection on the Internet, Western culture, and the forgetting of women. 21:00 – Reflection on results and open doors to the public. Caroline Godart is a teacher at IHECS, and a researcher at ULB in Brussels. She is the author of the book The Dimensions of Difference: Space, Time and Bodies in Women’s Cinema and Continental Philosoph. While Just for the Record questions and occupies digital collaborative knowledge platforms, it is easy to forget that online initiatives depend on the existing structures of archives, both grassroots and institutionalised. An organisation that has been an invaluable companion for our events is RoSa, a knowledge center for gender and feminism based in Brussels. It is in collaboration with them that we would like to invite you to a day of reflections and discussions on the possibilities and challenges of queer and feminist archives. As RoSa is facing an imminent double relocation — physical and digital —, the diverse problematics surrounding the development and the maintenance of a (queer/feminist) library and archive are being exacerbated. Concerns range from the categories used by search engines and online catalogues, to very practical ones like the need to carefully balance the weight of books for the floors not to collapse. Just as it happens on Wikipedia, the techniques and methods of archiving risk reflecting existing biases if we don't actively question them. How do we keep traces of the voices that are so often silenced because they don't fit within existing frameworks? How do we create new modes of recording those stories and rethink the traditional library/archive to accommodate those atypical documents? Along with presentations on the work that lies behind the RoSa library and archives, we have invited three guest speakers to broaden the topic of queer archives. 11:20 – RoSa Doc: introduction of RoSa’s projects, its library, its archives and its knowledge center, and upcoming changes. 14:30 – Marion Wasserbauer: presentation "Queer Lives and Queer Archives: Listening to music in LGBTQ lives"
16:00 – Round off, what to take home/into the future. Elk jaar organiseert ‘Dames draaien’ een festival van films van vrouwen. « Draai films, dames » zei Alice Guy Blaché in 1914. Een eeuw later geven vrouwelijke cineasten nog steeds gehoor aan de oproep van deze filmpionier en blijven ze onze kijk op de wereld verrijken. Hun films zijn vindingrijk, weerbarstig en maken komaf met stereotypes. Ze zitten vol humor, woede en nemen geen blad voor de mond; deze films verruimen onze blik op de wereld. Ter gelegenheid van de Dames Draaien Festival, Just For The Record stelt een workshop de representatie van vrouwen filmmakers op het scherm. Samen met filmmaker Anne Smolar en mede-oprichter van het festival Marie Vermeiren, zullen we meer over de herstory van het festival weten, en over vrouwen en feministische filmmakers. We bekijken hoe ze worden vertegenwoordigd op Wikipedia, als ze zijn, en hoe zij met elkaar verbonden zijn. De oproep tot deelname is nu gesloten (en overboekt), maar er zal een publieke presentatie zijn (te bevestigen), stay tuned! Just For The Record’s workshop will focus on the production of more equal knowledge on Wikipedia – a platform to re-write history in a new and collaborative way. The presence or absence of links between articles can help identify patterns of gender bias. As observed by a 2015 study, “women on Wikipedia tend to be more linked to men than vice versa”. Wikipedia pages are linked to other pages within the platform by different types of threads: blue for the links to existing pages, and red for the pages that have either been deleted or that are yet to be created. Red links are therefore making visible something that doesn’t exist on the encyclopedia, a hole in the fabric. They can also be taken as an invitation for other users to acknowledge that information is missing and to take action. Projects like Women in Red are using this feature to publish lists of women whose names are still in red, inviting us to activate them thus turning them blue. After the introductory presentations, we would like to invite the participants to discuss these issues and start editing Wikipedia, weaving different articles together to create unprecedented connections. This workshop is part of a program put together by Hana Miletić as part of her exhibition "Materials". Bots, robots, cyborgs, met An Mertens, Cristina Cochior en Zora Robot, in Muntpunt. Twee dagen van Just For The Record bij de Muntpunt! 18:30 – lezing door An Mertens: Uncertainty detected? + selectie boeken uit de Muntpunt collectie, samengesteld door Martine Seys. Guest speaker: An Mertens is an artist, writer and storyteller. As a member of Constant she experiments with writing and storytelling on the web, on paper, or in a performative context. She co-initiated Algolit, a workgroup around i-literature, code and texts. This group inspired Algoritmic Storytellers, her actual research on the narrative perspective of algorithms. In 2013 her experimental novel 'Tot Later' was published with De Bezige Bij, Antwerpen. Developers of AI often use Wikipedia and Wikidata as training material for their applications, because it is only corpus available that is large, well structured, multi-lingual, peer-reviewed, up-to-date and free to use. Mapping language to a computer model is still an experimental practise which requires compromises and contains many grey zones. An Mertens guides you through a self learning algorithm showing the different stages of the process and highlighting some uncertain zones in the decision making, while the algorithm tries to detect uncertain zones in the texts she feeds it with. Guest speaker: Cristina Cochior (RO) is a researcher, designer and bot custodian working in the Netherlands. Currently completing an MA in Media Design and Communication at the Piet Zwart Institute, her interests revolve around automation practices, disrupting the interface and peer to machine knowledge production. Her current research topic is the power relation between human and non-human participants in knowledge production, with a focus on the Wikipedia anti-vandalism bot Cluebot NG. Guest performer: Zora, a humanoid “girl” robot, developed to perform in residential care centers, in schools with autistic children and in various types of hospitals, trained by Tom Rottinghuis to become a member of the team of the Muntpunt library. *De evenementen zijn gratis. Versnaperingen en drank worden voorzien. Voor vrijdag 10.06: klik hier! Voor zaterdag 18.06: klik hier! Deze twee evenementen worden georganiseerd in samenwerking met het fantastische team van de Muntpunt: Lise Vanderpiete, Jurgen Waegeman, Martine Seys, Tom Rottinghuis, Jan Nachtergaele en Zora. Just For The Record zal aanwezig zijn bij Ladyfest in Brussel op Zondag 20 Maart. Ladyfest is een lokaal-georganiseerd DIY niet-commercieel festival. Het eerste Ladyfest vond plaats in Olympia, in Amerika, in 2000. Het project ontstond als reactie tegen de onzichtbaarheid van vrouwen in de kunst- en muziekscene. Daarom opende het eerste Ladyfest een ruimte voor expressie voor vrouwelijke artiesten en activisten gedurende meerdere dagen met performances, concerten, discussies. Het concept verspreidde zich naar meer dan 50 steden over de hele wereld (Brussel, Parijs, Berlijn, Amsterdam, Bordeaux, enz. ), en van elk festival werd een uniek evenement gemaakt. The idea is eenvoudig: Een groep vrijwilligsters organiseert een meerdaags festival rond thema's: creativiteit, autonomie, kennis delen, gendergelijkheid en strijd tegen heteronormalitiviteit. Het is ook een gelegenheid om een gemeenschap te bouwen, discussies te voeren en samenwerking tussen vrouwen, het lokale en het internationale netwerk te stimuleren. Ladyfests zijn gebaseerd om het idee om alternatieve, vriendelijke en open ruimtes te creëren. Gender Redirect bij Amazone, met Femke Snelting en Frau Picha. Guest speaker: Femke Snelting, artist and designer, working at the juncture between design, feminism and free software. Femke co-initiated the project pattern.en.paternalism, a contribution proposed to Pattern, a web mining module initiated by the Computational Linguistics & Psycholinguistics research center at the University of Antwerp. The pattern.en.paternalism feature should detect if and to what extent a text could be considered ‘paternalist’. Through this project and other ones, Femke explores the actual conditions, context and work of annotation involved in the practice of datamining. 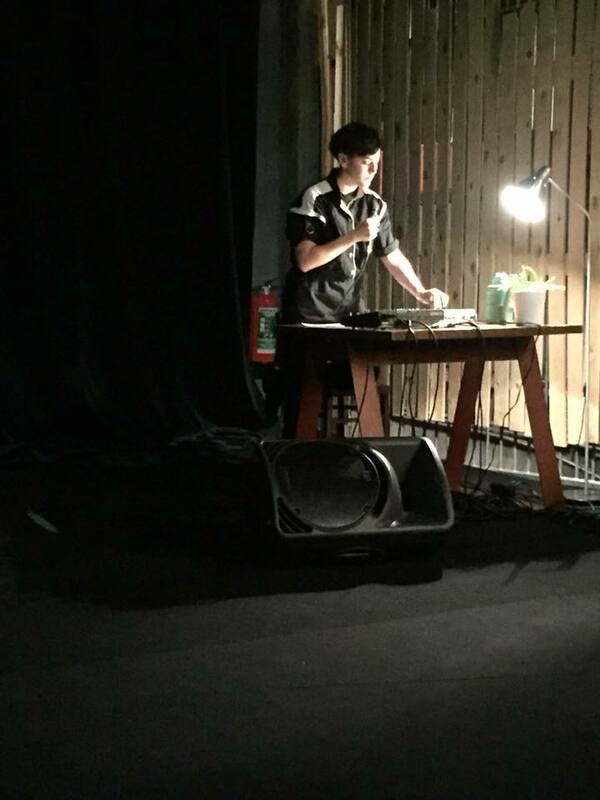 Guest performer: Frau Picha is a baroque-narcissistic sound performance project (solo or collaboration, in real or online), a human-machine laboratory which goes with the motto "enjoy ourselves, seriously!". Heldinnen bij PianoFabriek, met Catherine Lenoble en Clara Thomine. 12:00 – presentatie en open discussie over de representatie van heldinnen op Wikipedia: what can be added or modified? Chanting in its many forms, as protest slogans, as persistant repetition, as storytelling, as songs of ritual and as a tool that bonds several indiviuals into one entity. Recording because oral sources will need to be included in how we write history today, and recordings from our pionneers let us understand history better. Seeing how marginalized groups have long been exempted from written publications, but have spread their stories in other ways, we need to put care into rethinking what we consider credible sources for writing history. With the help of guest speakers and performers we will look into chants, alternative history sources and ways to decolonise views on source credibility. Wikipedia will be used to varying degrees in these events, depending on the guest and the subject at hand, but we invite you to enjoy a mix of input and output, addressing oral history and its importance as a narrative and collective practice. Feminist chants and slogans will guide us in the editing of Wikipedia pages, to add missing narratives to the polyphonic collaborative encyclopedia. The event will focus on female pioneers of electronics in the field of music, art and activism. We will be discussing how to best record these heroines, with a focus on oral history, music and alternative history sources during a Wikipedia edit-a-thon. Elles Tournent organizes an annual women’s film festival. “Roll’em, ladies! ” said Alice Guy Blache a pioneer of cinema, in 1914. A century later women filmmakers continue to enrich our world. They resist, invent and break stereotypes. And their movies, which are full of humour, rage or impertinence, help us discover other realities, other truths. On the occasion of the Elles Tournent Festival, Just For The Record proposes a workshop which invites you to question gender and its representations both on and off the screen. Together with filmmaker Anne Smolar and co-founder of the festival Marie Vermeiren, we will go back in the herstory of the festival and highlight women and feminist filmmakers. We will look at how they are represented on Wikipedia, if they are, and how they are connected to each other. the call for participation is now closed and overbooked, but there will be a public presentation (tbc), stay tuned! Bots, robots, cyborgs, with An Mertens, Cristina Cochior and Zora Robot, at Muntpunt. Just For The Record is happy to announce a new duo of events entitled Bots, robots, cyborgs, exploring the writing of non-human agents like the bots on Wikipedia. In our two upcoming events, we will take as object the Wikipedia bot: what is the gender of this denizen of cyberspace? Can the bot ever be, like Wikipedia wants itself to be, neutral? 18:30 – presentation by An Mertens: Uncertainty detected? + a special selection of books by Muntpunt librarian Martine Seys. Developers of AI often use Wikipedia and Wikidata as training material for their applications, because it is the only corpus available that is large, well structured, multi-lingual, peer-reviewed, up-to-date and free to use. Mapping language to a computer model is still an experimental practise which requires compromises and contains many grey zones. An Mertens guides you through a self learning algorithm showing the different stages of the process and highlighting some uncertain zones in the decision making, while the algorithm tries to detect uncertain zones in the texts she feeds it with. *The events are free, and light food and drinks will be provided. For Friday 10.06: click here! For Saturday 18.06: click here! These two events are organised in collaboration with the amazing Muntpunt’s team: Lise Vanderpiete, Jurgen Waegeman, Martine Seys, Tom Rottinghuis, Jan Nachtergaele and Zora. The Just for the Record team is happy to be part of the Ladyfest in Brussels on Sunday the 20th of March. Ladyfest is originally an American project that was created in order to react to the invisibility of women on the artistic and musical scene. It has grown into an international non-profit event that takes place in more than 50 cities all over the world. Gender Redirect, with Femke Snelting and Pascale Barret, at Amazone vzw. Just For The Record organizes its second event, Gender Redirect, a day bringing attention to gender representations in language constructions. Gender Redirect takes over the threads developed in the previous event, heroine, and continues its analysis of the process of Wikipedia editing, with its specific functions such as ‘view history’ and ‘talk page’, analysis tools like metrics and operations like redirection and disambiguation - to investigate the possibilities and challenges of gender-neutral writing. Heroines, with Catherine Lenoble and Clara Thomine, at PianoFabriek. A day dedicated to presentations, discussions and Wikipedia editing, addressing gender issues around the theme of heroines, with guests Catherine Lenoble and Clara Thomine. Despite Wikipedia’s efforts to come up with solutions to live up to their motto “the free encyclopedia that anyone can edit”, not only do the contributors predominantly identify as men, but the contents published also show partial gender representations. With platforms as Wikipedia becoming more important in our society these issues require attention. As a symbolic example, the article ‘heroine’ is automatically redirected to the article ‘hero’, and its emblematic figures are mostly male. Next to the issues of authorship and subject matter, the writing style and article structure that have become idiomatic on Wikipedia cause their own issues. A classic example of this is the amount of articles about women that starts with “this woman was the sister/wife of this famous man” in their first or second sentence. During Heroines, we will take these observations as the point of departure for lectures and discussions, and intervention—the day includes a crash course in Wikipedia editing. 12:00 – open discussion on the representation of heroines on Wikipedia: what can be added or modified? *The event is free, and a lunch, snacks and drinks will be provided. Please register, we have a maximum capacity of 25 participants. Catherine Lenoble is a Brussels-based writer who explores ways of reading and writing in present time, experimenting with cross-genre narratives and hybrid fictional objects (print, online). She is engaged with writing in different collaborative environments and co-initiated the research group Algo-lit(algorithms & literature) in 2012. Her project Anna K, is currently shown at Constant vzw and online, and a fiction, Anna K, is to be published by HYX editions in 2016. Clara Thomine a Brussels-based performance, video and installation artist. She studied at École nationale supérieure d’art de Nancy until 2011, after which she obtained an MFA in installation, performance and video from ERG, Brussels in 2014. She recently won the Prix de la SOFAM Médiatines Bruxelles (2014), and the Prix de l’Institut français at the Mulhouse Biennale (2015) and is currently having a solo show at c-o-m-p-o-s-i-t-e gallery in Brussels. Des slogans scandés lors de manifestations, aux hymnes révolutionnaires, aux sons du futur, le chant est rassembleur et porteur d'histoire. Si l'accès à l'éducation, à l'écriture et à la publication fut longtemps réservé aux hommes blancs, divers groupes marginalisés en raison de leur sexe, de la couleur de leur peau et/ou d'autres facteurs ont néanmoins imaginé divers moyens de faire entendre leur voix et de perpétuer leurs histoires. "Recording" fait donc référence à la nécessité de préserver ces sources et de trouver le moyen de les inclure dans l'histoire. Cet automne, le Beursschouwburg présente un ambitieux programme intitulé The Future is Feminist, dans lequel nous avons le plaisir de présenter trois workshops autour du thème Chanting & Recording. Ces événements sont gratuits et ouvert à tou·te·s! Dans le cadre du festival Voix de Femmes, nous proposons une session collective d’édition sur Wikipédia sur le thème des pionnières de l’électronique. Amenez votre ordinateur portable : on se charge de vous emmener dans les circuits de l’encyclopédie en ligne pour y ajouter des informations sur vos héroïnes ! Ce workshop est gratuits et ouvert à tou·te·s! Un workshop dans le cadre d’Art+Feminism, une campagne internationale initiée en 2014 à New York par plusieur.e.s artistes qui propose à ses participant.e.s d’éditer Wikipédia pour réduire les biais de représentation des artistes femmes cis et trans, bref tou.te.s celles et ceux qui ont toujours été oublié.e.s dans l’histoire et qui continuent à l’être. Ce workshop propose tout simplement de se rassembler pour lire et éditer des pages concernant des artistes passionantes, avec un focus particulier sur les livres et multiples d’artistEs. Une sélection de livres et de documents sera préparée, à laquelle vous pouvez contribuer en amenant vos livres. Évenement gratuit et ouvert à tou.te.s! Merci de nous envoyer un email à info[at]justfortherecord.space pour réserver et avoir plus d’informations! Prenez votre ordinateur portable (ou contactez-nous si vous n’en avez pas la possibilité). Just For The Record a le plaisir d’annoncer un nouvel événement intitulé Memory Factory, explorant la question de la mémoire collective, dans notre quotidien et en ligne, dans une perspective féministe. De qui nous remémorons-nous et de quelle manière se façonne notre vision de la société, celle du passé et celle du présent ? Nous porterons plus spécifiquement notre attention sur le champ des arts de la scène et de ses représentants en Belgique pour y trouver des réponses et nourrir la plateforme Wikipédia. Cette soirée sera l’occasion de mieux décrypter ce que nous retenons de notre société et la manière dont nous souhaitons la consigner. Caroline Godart mènera une réflexion sur l’oubli des femmes dans la civilisation occidentale et sur Internet. 21:00 – Retour sur les résultats et portes ouvertes au public. Caroline Godart est chargée de cours à l’IHECS, collaboratrice scientifique à l’ULB, et auteure du livre The Dimensions of Difference: Space, Time and Bodies in Women’s Cinema and Continental Philosophy. Évenement gratuit et ouvert à tou.te.s! Nous préparons toujours de la nourriture (vegan + sans gluten) et des boissons. Merci de nous envoyer un email à info[at]justfortherecord.space pour réserver et avoir plus d’informations! Prenez votre ordinateur portable (ou contactez-nous si vous n’en avez pas la possibilité). Évenement gratuit et ouvert à tou.te.s! Nous préparons toujours de la nourriture (vegan + sans gluten) et des boissons. Merci de nous envoyer un email à info[at]justfortherecord.space pour réserver et avoir plus d’informations! Si vous le souhaitez vous aurez l’occasion d’éditer des pages Wikipédia dans la bibliothèque, dans ce cas prenez votre ordinateur portable. Elles Tournent organise chaque année un festival de films de femmes. « Tournez, mesdames ! » disait en 1914 Alice Guy Blaché, pionnière du cinéma. Un siècle après, les femmes réalisatrices continuent d’enrichir notre vision du monde. Elles résistent, inventent, cassent les stéréotypes. Et leurs films, pleins d’humour, de fureur ou d’impertinence, nous font découvrir d’autres réalités, d’autres vérités. À l’occasion du festival Elles Tournent, Just For The Record propose un workshop dans lequel les participant.e.s seront invité.e.s à questionner les représentations de genre sur et hors écran. Avec la réalisatrice Anne Smolar et la co-fondatrice du festival Marie Vermeiren, nous reviendrons sur d’histoire du festival et mettrons en lumière des réalisatrices de films. Nous observerons comment elles sont représentées sur Wikipedia, si c’est le cas, et comment elles sont liées les unes aux autres. l’appel à participation est maintenant terminé (et plein! ), mais il y aura une présentation publique (à confirmer), stay tuned! À l’occasion du festival Pink Screens, Just For The Record propose un workshop dans lequel les participant.e.s seront invité.e.s à questionner les représentations de genre sur et hors écran. Avec la réalisatrice Anne Smolar et des membres de l’équipe du Pink Screens, nous reviendrons sur d’histoire du festival et mettrons en lumière les réalisatrices de films lesbiennes et féministes qui ont fait partie de son programme. Nous observerons comment elles sont représentées sur Wikipedia, si c’est le cas, et comment elles sont liées les unes aux autres. Nous prolongerons le fil développé pendant notre dernier événement dans le cadre de l’exposition d’Hana Miletić au Beursschouwburg, sur les liens (rouges). bots, robots, cyborgs, avec An Mertens, Cristina Cochior et la robote Zora, au Muntpunt. Just For The Record a le plaisir d’annoncer deux nouveaux événements intitulés Bots, robots, cyborgs, explorant l’écriture d’agents non-humains comme les bots sur Wikipédia. Si de récentes études ont montré que les femmes ne représentent qu’une petite minorité des personnes contribuant à Wikipédia, d’autres études montrent également qu’une majorité de l’activité édioriale est menée par des bots, éditeurs non-humains qui semblent échapper à la binarité genrée qu’on applique aux corps humains. Depuis la création d’internet, des gens ont vu dans le cyberespace une promesse d’aller au delà des genres, des races et des classes. Une espace pour construire une “empowering virtual reality”, comme Essex Hemphill le dit dans sa conference On the Shores of Cyberspace, Black Nations/Queer Nation? en 1995. Dans son Cyborg Manifesto, Donna Harraway présentait la figure du Cyborg comme identité fragmentée et post-genre. Elle y invitait les féministes à se ré-approprier les nouvelles technologies comme des outils féministes. Ces mêmes chercheu·se·r·s remarquaient déjà que les barrières que l’on trouve dans l’espace hors-ligne existent aussi dans le cyberespace. Depuis lors, des chercheuses et des chercheurs ont exploré les différentes façons dont les représentations en ligne sont structurées autour des genres, des races et des classes. Dans nos deux prochains événements, nous explorerons l’objet du bot sur Wikipédia: quel est le genre de cet habitant du cyberespace? Est-ce que le bot peut, comme Wikipédia le souhaite elle-même, être neutre? 18:30 – présentation par An Mertens: Uncertainty detected? + une sélection spéciale de livres du Muntpunt par Martine Seys, bibliothécaire. Invitée: An Mertens est une artiste, écrivaine et racconteuse d’histoires. Elle est membre du groupe de Constant (Bruxelles) qui travaille sur l'art et les médias, en particulier le logiciel libre, les méthodologies féministes et la culture libre. Developers of AI often use Wikipedia and Wikidata as training material for their applications, because it is they are the only corpora available that are large, well structured, multi-lingual, peer-reviewed, up-to-date and free to use. Mapping language to a computer model is an experimental practise yet, that implies a lot of compromises, grey zones, uncertainties. An Mertens guides you through one such self learning algorithm showing the different stages of the process and highlighting some uncertain zones in the decision making, while the algorithm tries to detect uncertain zones in the texts she feeds it with. Cristina Cochior (RO) est une chercheuse, designer et gardienne de bots travaillant aux Pays-Bas. 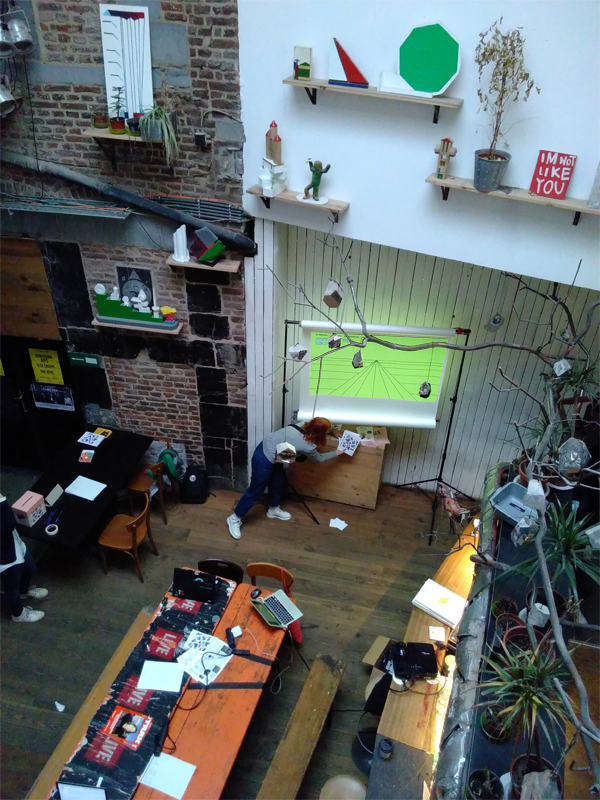 Actuellement dans le Master Media Design and Communication au Piet Zwart Institute, elle s’intéresse aux pratiques d’automatisation, de perturbation des interfaces et de la production de savoirs “peer-to-machine”. Son sujet de recherche actuel est les relations de pouvoir entre les humains et les participants non-humains dans la production de savoirs, avec un focus sur le bot anti-vandlisme sur Wikipédia Cluebot NG. Zora, un robot humanoïde féminin, développé pour des activités en centres pour personnes âgées, dans des écoles auprès d’enfants autistes et pour différents types d’hôpitaux. Au Muntpunt, Tom Rottinghuis l’accompagne dans sa formation pour intégrer l’équipe de la bibliothèque. *Les événements sont gratuits, et un repas de midi, des collations et des boissons seront offertes. Pour vendredi 10.06: cliquez ici! Pour samedi 18.06: cliquez ici! Ces deux événements sont organisés en collaboration avec la super équipe du Muntpunt: Lise Vanderpiete, Jurgen Waegeman, Martine Seys, Tom Rottinghuis, Jan Nachtergaele et Zora. L’équipe de Just for the Record sera présente au Ladyfest à Brussels dimanche 20 mars, pour deux présentations, de 15:00 à 16:00 et de 17:00 à 18:00. Ladyfest est un festival non-lucratif et DIY, entièrement porté par des bénévoles. Le concept est né en 2000 à Olympia (USA), à l’initiative de filles de la mouvance Riot Grrrl1, en réponse à la sous-exposition des femmes sur les scènes musicales et artistiques. Depuis, il s’est répandu un peu partout dans le monde (Sao Paulo, Johannesburg, Paris, Madrid, Jakarta, Melbourne, Stockholm...), chaque lieu se le réappropriant pour en faire un événement unique. La plupart des capitales européennes en ont ainsi vu apparaître, liant dynamiques locales et internationales. Mais pas Bruxelles ! Il y avait eu quelques tentatives mais ce manque sera réellement comblé en 2012 avec le premier Ladyfest proposant à tou-te-s un espace d’expression dédié aux artistes et activistes femmes. Le principe d’un Ladyfest est simple : un groupe de volontaires prépare un festival de quelques jours autour des thèmes tels que la créativité, la diversité, l'autonomie, l'échange de savoirs, la promotion de l’égalité entre les sexes et les genres et la lutte contrel’hétéronormalité. C’est également l’opportunité de bâtir une communauté, susciter des discussions et des collaborations parmi les femmes et le réseau associatif local et international. Les Ladyfest reposent sur l’idée de créer un espace alternatif, amical, ouvert. Gender Redirect à Amazone, avec Femke Snelting et Pascale Barret. Just for the record organise son deuxième événement, Gender Redirect, une journée dédiée à la représentation des genres dans les constructions de language. Gender Redirect prolonge les questions abordées lors de l’événement précédent, héroines, en observant les procédés d’écriture sur Wikipédia, et ses fonctions spécifiques comme les onglets ‘historique’ et ‘discussion’, les outils d’analyse ‘metrics’ et les opérations de ‘redirection’ et de ‘disambiguation’ (homonymie). Femke Snelting, artiste et graphiste travaillant à l’intersection entre le design, le féminisme et le logiciel libre. Femke est une des instigatrices du projet pattern.en.paternalism qui explore les conditions actuelles des pratiques de datamining. Frau Picha est un projet de performance sonore barocco-narcissique (en solo ou collaboration, en chairs et en ligne), un laboratoire d'interfaces humain-machine dont l'adage annonce le ton "amusons nous, sérieusement!". Héroïnes à PianoFabriek, avec Catherine Lenoble et Clara Thomine.